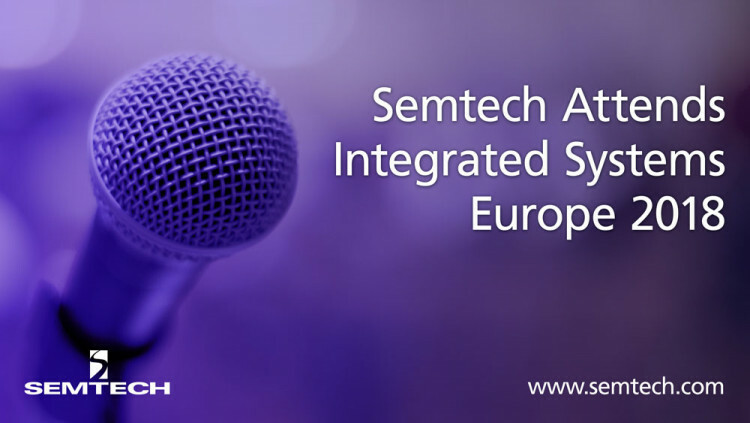 CAMARILLO, Calif. — Feb. 1, 2018 — Semtech Corporation (Nasdaq: SMTC), a leading supplier of high performance analog, mixed-signal semiconductors and advanced algorithms, today announced its participation at Integrated Systems Europe (ISE) 2018 with the SDVoE Alliance™ at stand 3-B150. The SDVoE Alliance’s primary mission is education and providing an extensive array of Professional AV training sessions at ISE 2018. Gareth Heywood, Senior Technology and Product Marketing Manager of Semtech’s Signal Integrity Products Group, will lead a session on Feb. 5 at AudioForum focused on leveraging the SDVoE standard for high-performance AV network deployments. The session emphasizes the advantages of Semtech’s BlueRiver™ technology compared to other standard and related systems, while highlighting the benefits of the SDVoE Alliance in speeding up industry adoption of AV-over-IP for Pro AV. Semtech’s BlueRiver platform, developed by the AptoVision product engineering team, provides advanced chipsets for AV signal distribution. The award-winning BlueRiver technology has forever changed the dynamics of the Pro AV industry by letting installers and OEMs replace proprietary AV matrix switches with off-the-shelf Ethernet networks that deliver dramatically better price/performance, flexibility and scalability. Enabling end-to-end systems for AV and KVM signal extension, IP-based switching, video wall and multi-view applications, BlueRiver chipsets are the foundation of SDVoE technology, offering zero-latency, uncompressed 4K streaming over standard Ethernet with unique support for HDMI 2.0a and HDR. They also integrate high-fidelity video scaling, windowing and audio downmixing. For more information, visit https://www.semtech.com/products/professional-av. SDVoE is an initialism for “Software Defined Video over Ethernet”. The SDVoE Alliance is a non-profit consortium of technology providers collaborating to standardize the adoption of Ethernet to transport AV signals in professional AV environments, and to create an ecosystem around SDVoE technology allowing software to define AV applications. The SDVoE Alliance participates in tradeshows and conferences, publishes white papers and case studies and promotes SDVoE technology, and solutions based on the technology, to system integrators, designers and consultants. Training and installer certification are also part of the mandate. The SDVoE Alliance founding members are Aquantia, Christie Digital, NETGEAR, Semtech, Sony and ZeeVee. All interested parties are invited to join the alliance and work toward its goals. For more information, visit www.sdvoe.org. All statements contained herein that are not statements of historical fact, including statements that use the words “will,” “expected to,” “designed to” or other similar words or expressions, that describe Semtech Corporation’s or its management’s future plans, objectives or goals are “forward-looking statements” and are made pursuant to the Safe-Harbor provisions of the Private Securities Litigation Reform Act of 1995, as amended. Such forward-looking statements involve known and unknown risks, uncertainties and other factors that could cause the actual results of Semtech Corporation to be materially different from the historical results and/or from any future results or outcomes expressed or implied by such forward-looking statements. Such factors are further addressed in Semtech Corporation’s annual and quarterly reports, and in other documents or reports, filed with the Securities and Exchange Commission (www.sec.gov) including, without limitation, information under the captions “Management’s Discussion and Analysis of Financial Condition and Results of Operations” and “Risk Factors.” Semtech Corporation assumes no obligation to update any forward-looking statements in order to reflect events or circumstances that may arise after the date of this release, except as required by law.